Oliver Queen and Roy Harper once patrolled the streets as Green Arrow and Speedy, but a massive falling-out left them estranged for years. Now, learn the truth behind the tragic dissolution-and triumphant reunion-of one of comics' most iconic super-duos as Green Arrow and Arsenal join forces once more! Oliver Queen's company has been up to no good since his supposed death, but Green Arrow is on the scene to make things right. Unfortunately for Ollie, he's the last person his former sidekick wants to see. 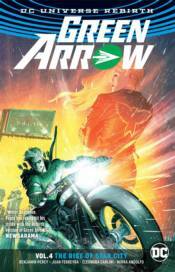 Collects GREEN ARROW #18-20 and GREEN ARROW ANNUAL #1.